But just what are the competencies required of a successful pastor? Well, that varies with the congregation and with the number of other members of the professional pastoral staff. 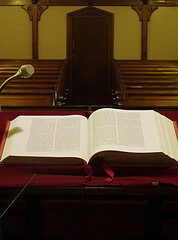 The more pastors the congregations have, the more specialized are the competencies required of the individual pastor. In cases where there is only one pastor we have been able to determine through research what are the twenty most important competencies of a successful pastor. Here are the first ten of these competencies together with a definition of each. Competencies are a combination of values, attitudes, skills, experience, and personal gifts. Accountability – acknowledges the need to hold him/herself accountable to others, willingly giving and receiving feedback. Commitment to God – entirely devoted to God, desiring to walk in daily dependence on Him and to reflect His character in thought, word and deed. Communication – listens attentively and speaks to both mind and heart with effectiveness and clarity. Conflict resolution – enables conflict to be resolved effectively with justice and fairness in order to restore wholeness and healthy relationships. Effective management – creates an environment where people, activities and resources are managed with energy, vision and clarity. Empathy – shows warmth and sensitivity to others, recognising and appreciating their feelings, concerns and needs. Encouragement – actively gives others hope in the future, re-energised and determined to go on. Humility – demonstrates a servant attitude towards others. Initiative – seizes opportunities showing creative insight into what might be accomplished. Interdependence – acknowledges his/her need of others, working with them in order to fulfil the values, vision and mission of the church. GovernanceMatters.com has developed a diagnostic tool by which pastors and congregations can participate in assessing these competencies. The primary purpose of the tool is to make a good thing better. A pastor can learn which competencies can be celebrated and which can benefit from more development. You may contact me for more information about the evaluation tool.